Recycling Services in Anaheim, CA | Sunwest Metals Inc. Need a website? Free website templates by professional designers at WTO. Incorporated in 1981, Sunwest Metals Inc. is a full service recycling company based in Anaheim and serving the greater Los Angeles and Orange County area. Since its inception, Sunwest Metals has become one of the leading metal recycling organizations in Southern California, providing invaluable services to builders, commercial businesses, and local residents. Known for offering superior value, Sunwest continues to develop and expand its products and services to meet the needs of a growing and changing customer base. Sunwest Metals is dedicated to supplying total solution recycling services for Southern California industries and residents in and the following counties: Orange County, Los Angeles County, and Riverside County. We are a benchmark organization committed to providing quality service and meeting the needs of our customers. With our state of the art facility, we are able to effectively service suppliers and the public with all of their recycling needs. Our reputation has been built on customer service while leading the industry in advances in safety and technology. 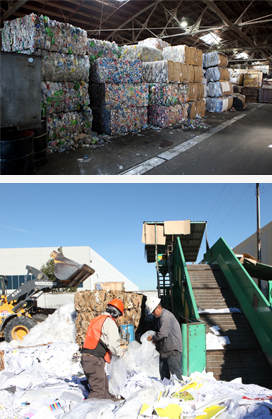 Our facilities are run by expertly trained staff whom strive to accommodate your specific recycling needs. Copyright © Sunwest Metals 2016. All rights reserved.